Hello! I stumbled upon your site and have been absolutely fascinated by your videos! You make it look so easy and your work is just beautiful! 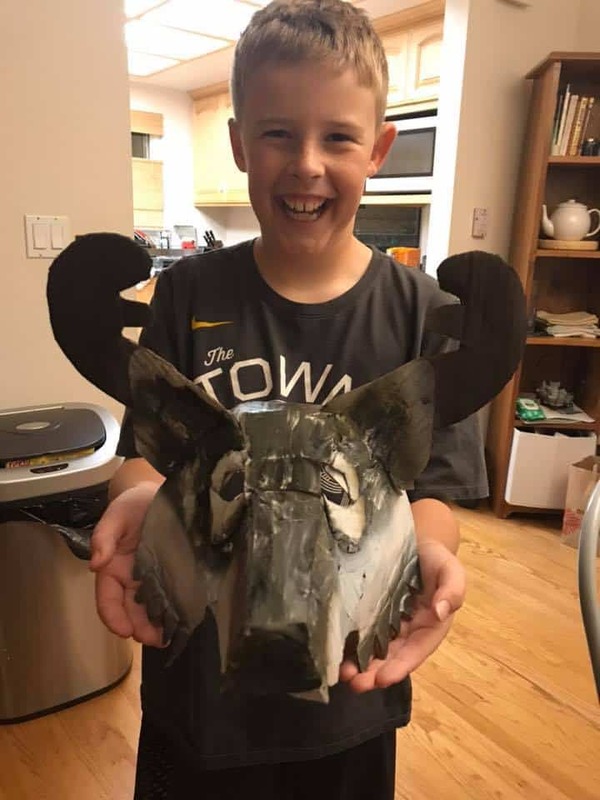 I started researching how to make a paper mâché bobcat for my son’s school project. I watched the raccoon videos, and think that would be a good base from which to start. Do you happen to sell the raccoon pattern that you used? Any help is much appreciated! Thank you! I do have the pattern for the raccoon. You can find it here. But you might also be interested in the cat series. It shows you how to build a pattern using photos, and goes through the process of building up the shapes. You can find the first post in that series here. Have fun! Hi Sharon. For a plaster look, the paper mache clay would be perfect. You could stick it directly to the wall, but it would be permanent, and if the family ever decided to move I’m not sure how they’d ever get it off. I would recommend making it as a separate piece of art, perhaps doing the sculpting over a piece of foam board. To make it really light, form the shapes with crumpled foil held on with hot glue. You can see how to sculpt with foil by watching my first video in the Egyptian blue hippo series. You will need to watch carefully to make sure the drying paper mache clay doesn’t cause the backing to curl up – that’s always a concern when working with paper mache of any kind over a flat substrate. Good luck with it – and be sure to come back and show it off when it’s done! Hi Pamala. I’m glad you’re enjoying the site. I don’t do workshops – I live in a very small town and don’t travel much, so it wouldn’t work out very well. I hope the videos and posts will help you get started. Do you have any clay work that you’d like to share with us? Do you sculpt, make pots, or ?? Hello Patricia, I am responding with an idea for hanging your mermaid. If the back of your sculpture/bas relief is closed (or partially closed at the upper reverse side that would lie flat against the wall), you might create a small “keyhole” shaped opening slightly below the top edge of the back surface of the mermaid. The keyhole opening is a round hole with a narrower slit that runs upwards for about 3/4” to 1”. It would be wise to reinforce this area of the backing. There are small, flat, metal “plates” with such holes in them that are mounted on mirrors or picture frames for the express purpose of hanging such items. You might be able to glue such a plate onto the back of your mermaid in order to reinforce the keyhole. A single nail is then all it takes to hang your piece. The diameter of the nail head must not be bigger than the hole, and the neck of the nail must not be thicker than the slit. It appears that I need a PVA glue. I would also like to put some sort of sealer/finish on. I heard you say something about a finish that appears like stone, but I didn’t hear exactly what the finish is. Would you mind sharing that information? Again, thank you so much for all the tutorials! Hi D. I would probably use an epoxy glue to attach an air dry clay sculpture to wood – although I probably have used PVA glue in the past. I have been told that the really quick 2-part epoxy glue isn’t nearly as strong as the slower ones. You can find several varieties at a hardware store. The finish you heard me talking about is probably the DecoArt Soft-Touch varnish. I’m glad you brought it up because your comment reminded me that I don’t have enough varnish to finish the giraffe I’m working on. I just ordered more. It doesn’t look like stone, but it feels like soapstone. And it has almost no shine, which I like for my animal sculptures. If that wasn’t the finish you were referring to, let me know. A while ago you did a video on a ciccada bug mask, and I replied how much I love those bugs and collect a lot of them. I tried to find a pattern to purchase but I cannot find it, could you please let me know how to get it, I really just want to make one to hang on my wall. Thank you very much. I just bought one of your 4 pattern deals yesterday and downloaded it so after the holidays I need to try my hand at them and definitely the ciccada bug. How exciting. Have a great holiday. I hope you have a great holiday, too. And be sure to come back and show us how your new sculptures turn out. We’d love to see them. Hi , I was wondering if you have a pattern for a dinosaur my grandson loves them.preferably a tyranasaurus Rex. I don’t have a pattern for a dinosaur, but there is a guest post on my blog showing you how to make one. Irma drew her own pattern but once you see how she made her dino you’ll see that it would be fairly easy. You can find it here. Hi Johanna. There are a few guest posts on the site from people who have used a product called Flex Seal to waterproof paper mache. I don’t know how long their sculptures have been outside and we don’t get regular updates. You can see Tom’s Life-Sized Bear post here. That said, I don’t recommend putting a sculpture made with paper outside. All of my own experiments have ended in disaster. The only way to make it waterproof paper is to coat it with some form of plastic or rubber, and if you leave even a pinhole uncovered the water will eventually seep in. The sculpture will also need to be re-coated regularly, because almost all forms of sealant will break down in sunlight. I recommend using a material that’s originally made for outdoor use, like epoxy clay for small items, and cement (or maybe fiberglass) for bigger ones. My epoxy clay squirrel has now survived two Minnesota winters outside and still looks the same as he did the day I made him. While Apoxy Sculpt and other epoxy clay products seem more expensive that paper mache to start with, there are benefits. You can use them in very thin layers like I did on my squirrel so you don’t need to buy as much, you can use the same armatures that you would use for a paper mache sculpture, and you don’t need to buy a separate (and expensive) sealer that may or may not work. Hi Matt. I do have a pattern for that elephant – it’s one of the last projects in my book Make Animal Sculptures with Paper Mache Clay. If you click that link you can see inside the book on Amazon.com. Thanks a million Jonni, your wolf mask saved us tonight. Our son had a school project due tomorrow morning that he’s been procrastinating on. So we got started around 5:30pm tonight and finished 3 hours later. Sure we skipped over the paper mache and did a quick spray paint…it turned out quite well. That was certainly a creative solution! And yes, it did come out well. I absolutely love that photo, too! Thanks for sharing. (And I hope he gets an A for his project). No, I have no goat. Sorry. I’m currently working on a pattern for a piglet (it will be really cute on a kid’s wall) and then I start on a giraffe. I might make a pattern for a wild goat someday – that would be really fun. jonnie, love your work. I’m thinking of making my daughter’s bulldog’s face and want to adhere the sculpture onto canvas. Is this possible with paper mâché work and is there special glue or medium that can attach the face automatically to the canvas? How many layers need to be done in order to sculpt the face realistically? I’m looking forward to this challenge and if you have any advice…it would be most welcomed. I have never used paper mache on canvas. An epoxy glue might work – the guys at your local hardware store might be able to give you some ideas. Hi, do you have a live size turkey pattern ? Hi Julie. No, I don’t have a turkey pattern. Sorry – but that does sound like a really interesting project. Especially those tail feathers! I’ll put it on my to-do list, but it probably won’t get done this year. What wonderful things you make! 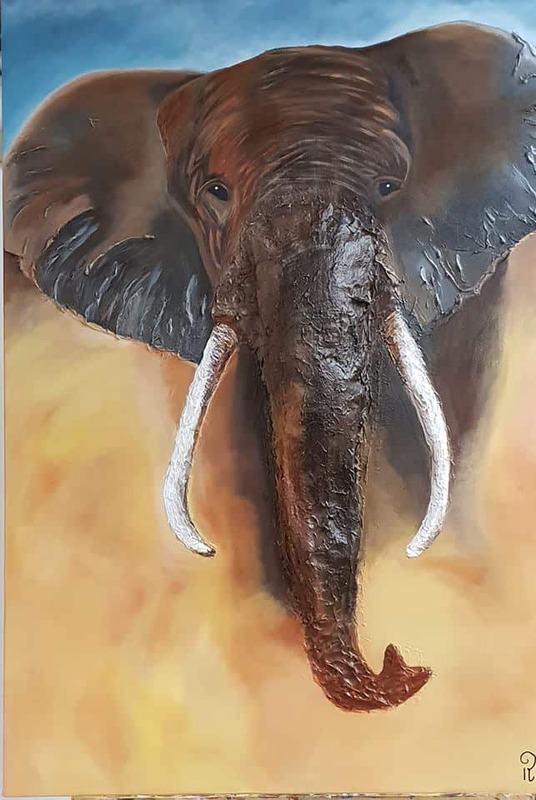 I would like some advice from you regarding how to make an elephant’s trunk for a 3D acrylic painting. I have a paint studio and teach people to paint with Oils and Acrylic paint and one student already made a elephant and it looks great, but at some point the trunk collapsed when it was painted. we have been able to restore it by sliding plastic underneath. See the attached photo for the result. We then made the trunk with powertex over a mold of chicken wire and I now think that I have to do it with paper mache. However, I wonder if I have to leave it hollow or make it massive to prevent collapse. Do you have an idea? Hi Bakker. You probably already received my email, but I didn’t realize you had also posted on the site. I will stick with my suggestion that you use foil and hot glue to create your trunk, and then cover it with masking tape so the paper mache will stick. It’s much easier than working with chicken wire, and gives the sculpture support from inside. Good luck with it! Hi – I just want to let you know how much I have enjoyed your site. I have learned so much from you and I’ve recommended you to a couple of friends. Thank you so much for sharing so much and such a light hearted and simple manner. Hi, My son is doing a King Tut death mask project. He used a styrofoam head and the rest of the mask he used cardboard and ducked tape. Can he use paper mache? It needs to look museum quality. Hi Sarai. Yes, he can use paper mache. It might not stick to the plastic duct tape, though. If it doesn’t, he can cover it with one more layer of masking tape, and then add the paper mache. If he wants the finished surface to be smoother, he might want to watch my video about making paper mache smooth. I hope he has fun with it. Hey Jonni, Your work is wonderful and I am happy to see all the variations of things that you can make. I second the request on the Dragon Mask Pattern. This is exactly what I’ve been looking for. I know you’re busy but if you can, I’d love to buy it. Thanks! my name is sudha.. i love your videos. i saw ur paper mache elephants big size. is there any chance can i buy those elephants? i am seriously looking for those elephant. Hi Sudha. Do you mean you’d like to buy a paper mache elephant that is already put together and painted? I don’t sell them myself, and I don’t know anyone who does. But you can take the pattern of the elephant you like to a local artist, and ask them to make it for you. It is still available. A few other people have told me they had problems with it, but they haven’t told me enough to help me fix it. I hope you have a few seconds to let me know what page you were on when you signed up. Did you fill in the form, and did the email with the download arrive in your inbox? Did the error message happen when you clicked on the download link, or when you tried to sign up? Knowing what happened would really help me get this fixed. I know there’s a problem, but when I fill in the form everything works, so I can’t figure out what’s wrong. I hope you’ll give me a bit more info – but in the meantime, I’ll add you to the list so the download link will be sent to you. Be sure to look for it in the next few minutes. Is your cheetah mask available as either a pattern or do you make on for sale? I have made my now 7year old grand daughter’s Halloween costumes every year since she was 8 years old. This year, she wants to be a cheetah and while I have the costume nearly done , I lack a mask. I saw yours and I know she would love it because it is so realistic and because it leaves her with movement room and does not appear too tight on her face. I hope you can answer soon as I need to get it done soon. Hi Patricia. I don’t have a cheetah, but you might be able to make the cat mask work if you add the spots and that distinctive stripe between the eyes and muzzle. You’d also want to make the ear round, and move them down the head just a little. Those small changes would make the mask look entirely different. Gosh, that would be fun! I’ll try, but I don’t know when I’ll have time.